Over the past two decades, several studies have focused on what children imagine scientists to be and do. The outcomes were predictable in many ways. Most children’s drawings and written responses were about white male scientists dressed in white lab coats with protective glasses working alone in laboratory settings. Since the pioneering work of Margaret Mead, investigators have found pervasive, but questionable, preconceived ideas of scientists among all levels of students (Barman, 1997; Bodzin & Gehringer, 2001; Eugster, 2013; Jarvis, as cited in BBC News, 2000; Mead & Metraux, 1957). In all studies, most of the students wrote about white male scientists—a pattern that in large part continues to reflect reality. The author sought to find ways for students to see scientists as individuals in a variety of settings and times, roles, and ethnic backgrounds. Recognizing that teachers’ impressions of scientists are conveyed in the classroom and affect students in profound but subtle ways, Mosley and Norris (1999) and McDuffie (2001) explored teachers’ perceptions of scientists and how those perceptions might impact student thinking. To address this question, written and pictorial data were collected among practicing and pre-service teachers. The teachers’ drawings extended the longstanding view of scientists as middle aged (71%) and male (84%). About half of the sketches included scientists wearing glasses and 36% with unconventional hairstyles. Over 50% were drawn wearing laboratory coats, 40% of which had pocket protectors; and 48% of drawings showed a very serious or crazed (9%) face. One finding that received little notice elsewhere was solitude. In the drawings, scientists stood alone in an environment surrounded by objects of research (54%) or knowledge (15%); their environments almost never included other people. Scientists were described as “intelligent, hardworking, and theoretical, but also as impersonal, boring, and nerdy. They were generally depicted as stern, older white males with unkempt hair and unfashionable clothes” (p. 18). McDuffie concluded that teachers’ stereotypes were the same as that of their students on most significant characteristics; their drawings of scientists did not evolve with professional maturation. In response to the above findings, Bodzin and Gehringer (2001) used student drawings to determine if a teaching strategy, engaging a female engineer scientist in the classroom could change students’ perceptions of scientists. The post-instructional data revealed a decrease in many stereotypical features after the female scientist visited the classroom. The students’ drawings depicted fewer scientists wearing lab coats and glasses, and there were fewer indications of danger. Also, more female figures were drawn after the instruction. The researchers concluded that exposing girls to female scientists in an elementary school classroom may have a positive influence on their perception of careers for women in the science and engineering fields. It would appear that in many cases, teachers are unintentionally communicating a biased viewpoint and promoting a male-dominated view of science. A study by Jarvis (2000) of over 4,000 children in Britain and Australia over eight years concluded that the “mad scientist” stereotypes continue to persist, at least among six to eight-year-olds. Alarmingly, this same study also revealed that children of Asian and African-Caribbean descent generally held the same opinions and drew similar drawings as their white peers; “boys never drew women and only very occasionally would a girl draw a female scientist…. It was also rare for a black or Asian student to draw a black or Asian scientist” (p. 2). Such findings lead us to the question: Why do children of diverse ethnic backgrounds rarely envision themselves as pursuing science related careers? Students’ drawings have continuously been analyzed to explore their impressions of scientists, but the impressions of students regarding Indigenous Science and how IS and WS are different but complementary ways of understanding the world have not. To address this void, this chapter extends the work of those above quoted authors who used student drawings to describe students’ perceptions of scientists. I became interested in this idea and wanted to investigate what effect a classroom inquiry exploring Indigenous Science (IS) would have on students’ perceptions of scientists, the work of scientists, and who does science. The study took place in two schools located in Victoria, British Columbia (BC): one class in an elementary school consisted of 23 students (11 boys and 12 girls) at the Grade 6/7 level, with one student of Aboriginal ancestry and one student who was a recent immigrant from South Korea. The second study took place at a high school and consisted of 22 students—6 boys and 16 girls. The population is of special interest because seven of the students were of Aboriginal ancestry—1 male and 6 females; all were from British Columbia and from a range of life experiences—from those who had grown up in urban centres such as Victoria to others who had lived in traditional rural communities until entry into high school. The students were taking the First Nations Studies 12 course, which explored the history and culture of the Aboriginal peoples of Canada. The study methodology consisted of the students’ scientist drawings, tape-recorded class discussions, post-instructional drawings, and tape-recorded teacher interviews. 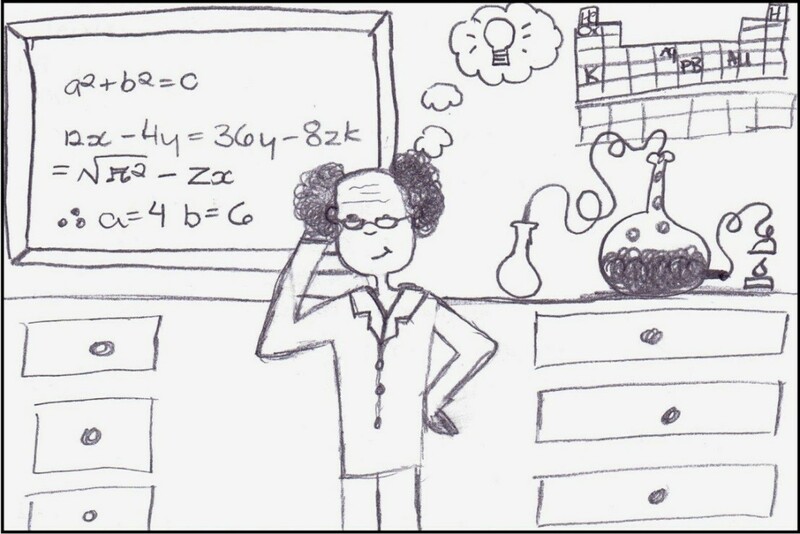 To understand the students’ perceptions of scientists, I asked students to draw a picture of a scientist and write a sentence explaining what the scientist was doing. I added questions directed at revealing the students’ perceptions of science, the work of scientists, and what type of person does science. Each class completed this activity prior to the instructional workshop and then completed a modified set of questions and drawings after the workshop. I developed a set of criteria for analyzing the students’ drawings: e.g., lab coat, gender, laboratory setting. In addition, I developed a set of questions to explore the students’ perceptions of Indigenous Science knowledge and their interest in pursuing science-related careers. Students were asked to identify as male or female, but they were not asked to reveal their ancestral identity. Because several high school students were of Aboriginal ancestry, they were asked to make up a name (a pseudonym), thus to some extent limiting our understanding of the thinking of the Aboriginal students as a group. The researcher felt that by not requesting their ancestral connections, the students would be provided a safe research environment, thus enabling some students to reveal their often hidden viewpoints. However, the researcher was able to identify four Aboriginal students by recalling the drawings they drew during the workshop and data collection sessions. The teachers were interviewed both prior to and after instruction. In addition, I took notes and recorded my reflections following my teaching. Interpretive analysis using students’ drawings, word-for-word discussions, and responses to questions seemed appropriate because it focused on documenting what and why things happen in a particular context from the participant’s perspective. I presented a three-day workshop (3 X 80 minutes) for students at both schools. The workshop provided a basic overview of Indigenous Science, as well as science-inquiry activities illustrating Indigenous Science examples. 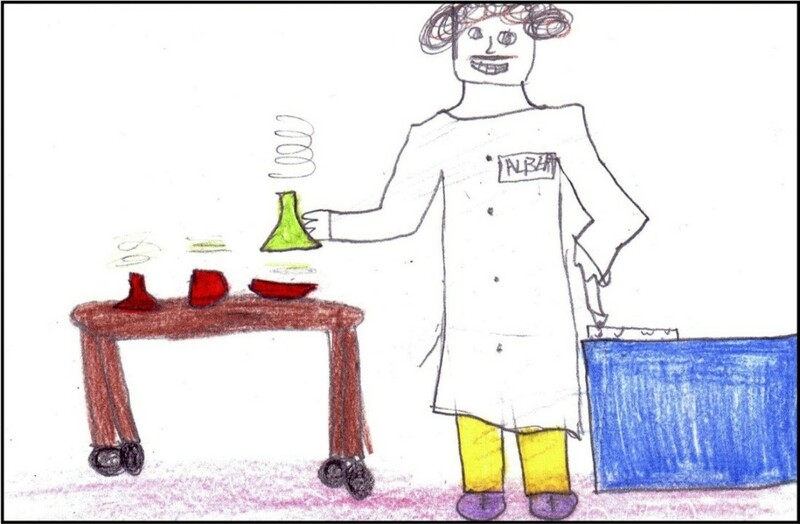 The students’ drawings extended the long-standing view of scientists as male with lab coats, most often wearing glasses, and working in stereotypical lab settings. Fifty-seven percent of the Grade 5/6 students and 85% of the Grade 11/12 students drew male scientists. 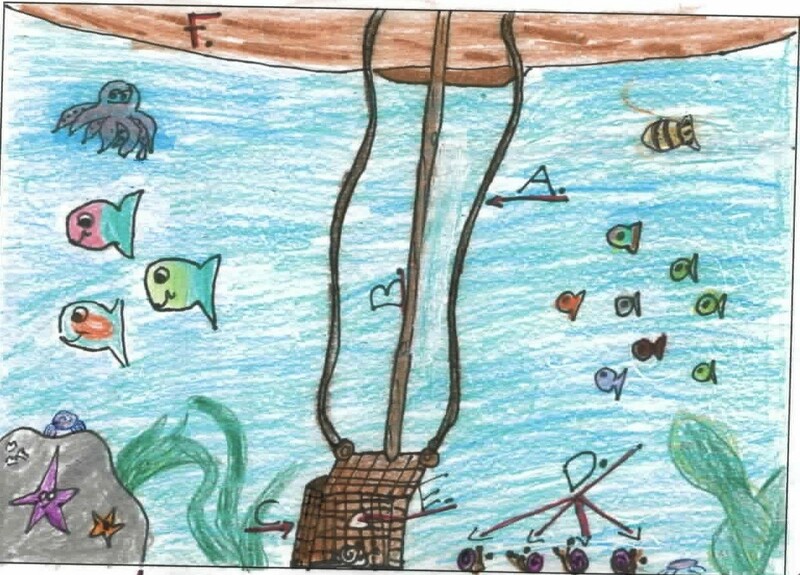 Forty-three percent of the Grade 5/6 students drew a female scientist and the majority of those drawings depicted young female scientists. Eight of the 12 elementary girls drew female scientists, and all 11 boys drew male scientists. Significantly, from post-instructional interviews with the middle school teacher, it was learned that two months prior to my visit, a female biologist had visited the classroom. It appears that a visit by a female scientist may have contributed to the large proportion of girls who drew female scientists. The high proportion of Grade 11/12 students who drew male scientists is alarming given the high proportion of females in that study (16 females and 6 males). Figure 9.1 ▲ “He is at a lab making chemicals and writing down the results. He is Albert Einstein.” Drawing by Grade 5/6 male student (2007). As in previous studies where the great majority of students drew scientists with stereotypical symbols of research, 91% of the Grade 5/6 students and 75% of the Grade 11/12 students drew stereotypic features such as laboratory tables, flasks, test tubes, microscopes, chalk boards, formulas, clocks, and so on. Compared to previous studies, fewer students in both 2007 studies drew scientists as mythic figures. One high school student referred to Frankenstein in the caption and one middle school student drew Albert Einstein (Figures 9.1 and 9.2). Figure 9.2 ▲ “This scientist is hard at work with a new invention. 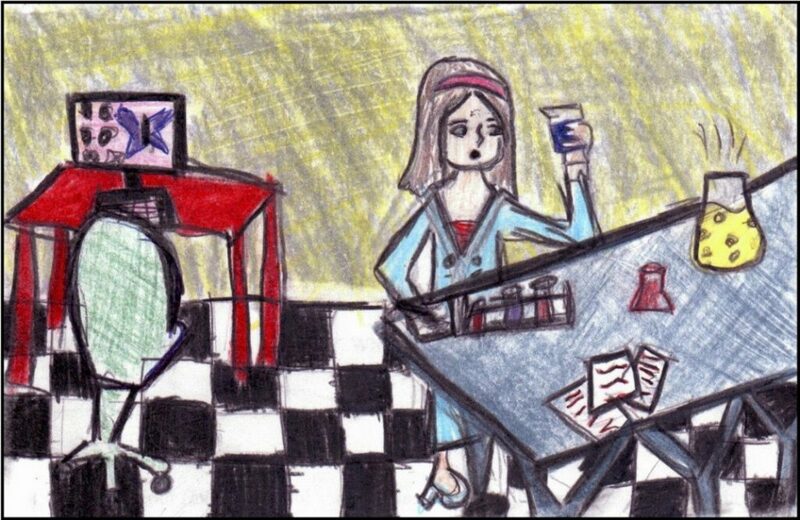 He is in his office putting together formulas and cooking up new concoctions.” Drawing by Grade 11/12 female student (2007). As in previous studies 55% of the Grade 11/12 students depicted indications of danger, but only 22% of the Grade 5/6 students included indications of danger. Indications of danger included the use of fire to bring about chemical change, chemicals that could explode, and robots that could go out of control. This smaller percentage of middle school students could reflect the greater proportion of female scientist drawings where danger was not a significant influence. Similar to previous studies where the great majority of students depicted scientists as Caucasian, 100% of both the Grade 5/6 and the Grade 11/12 students appeared to depict scientists as Caucasian (nothing in the drawing or caption suggested a person of ethnic ancestry other than Caucasian). Fifty-two percent of the Grade 5/6 and 55 percent of the Grade 11/12 students depicted scientists as middle aged to elderly. As in previous studies where the great majority of students drew their scientists indoors, 96% and 90% respectively drew their scientist indoors. Two exceptions were one Grade 5/6 male who drew his scientist outside “collecting rocks to study, or trying to find new specimens,” and one Grade 11/12 male who drew his scientist outside making a dugout canoe. Although a small proportion of students in previous studies viewed scientists as secretive in nature, zero percent of the 2007 students appeared to view scientists as secretive. 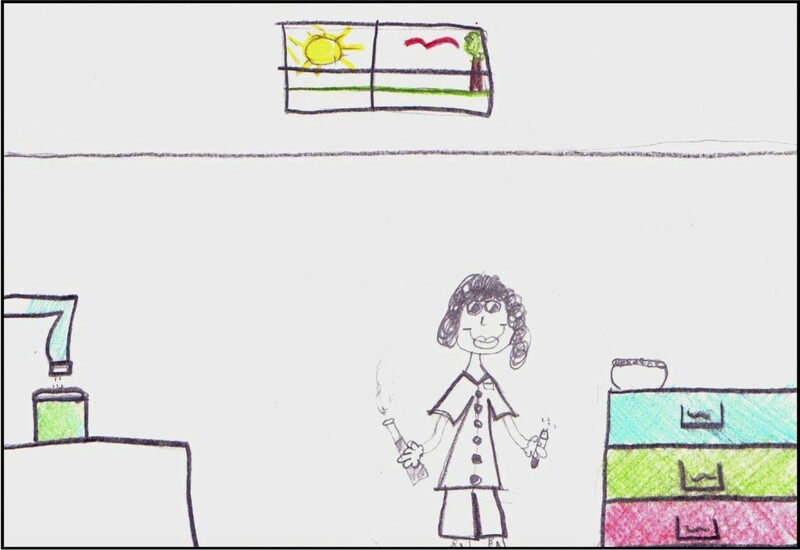 Figure 9.3 ▲ “My scientist is making medicine to stop all kinds of cancer.” Drawing by Grade 5/6 female student (2007). In short, prior to the instructional workshop the image of the “mad scientist” was alive and well amongst boys in both the middle school and high school classroom. Boys much more frequently than girls favoured the “mad scientist” stereotype, and much more frequently depicted scientists doing chemistry experiments. Girls, far more frequently than boys, viewed science as a tool for curing diseases, enhancing foods, or protecting wildlife and healing the earth. Similar to previous studies, a significant majority of middle school boys and high school boys and girls thought of scientists stereotypically as Caucasian, male, middle-aged or aging, working alone indoors in a lab setting, surrounded by beakers, test tubes and microscopes, and most often performing chemistry experiments. Since seven of the Grade 11/12 students were of Aboriginal ancestry, this stereotypical image of scientists, the work of scientists and who does science was of particular concern. “An activity for discovery. Doing experiments. The nuclear bomb.” (Grade 5/6 male). “Science is a logical explanation or formula for why and how things happen and creating new ways to make things happen” (Grade 11/12 female). Not surprisingly, high school students, far more frequently than middle school students, defined science as subject areas: biology, chemistry, earth science, and physics. The students who responded “yes,” that “Indigenous people have science,” were asked to draw a picture of an Indigenous person doing science and to write a caption explaining their illustration. Figure 9.4 ▲ “The girl is cooking dinner by starting a fire and drying fish. She is waiting for the men to come home from hunting.” Drawing by Grade 5/6 female student (2007). 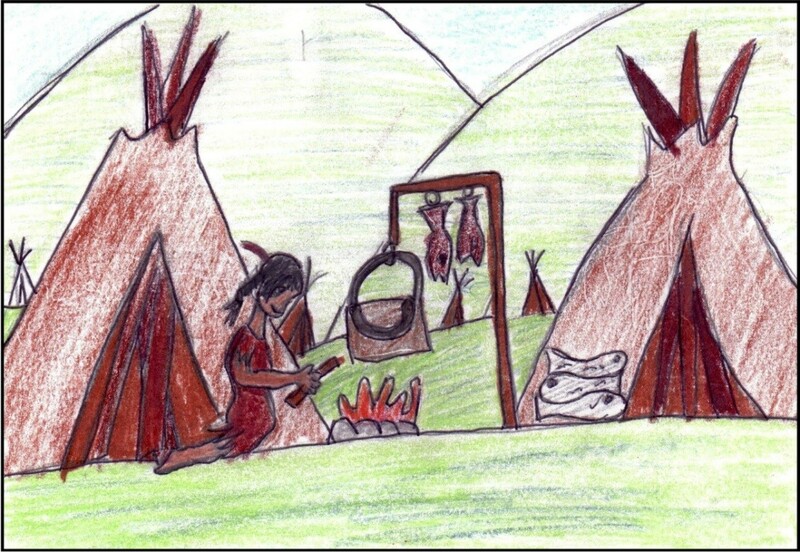 Prior to instruction, the great majority of both Grade 5/6 and Grade 11/12 students’ drawings of Indigenous Science depicted traditional knowledge in outdoor settings much of which would be typical of the traditional past: “harvesting plants for medicines,” “making a canoe,” “carving a fishing spear,” “making a net,” “rubbing a rock and stick together to test out fire,” “looking at the sky to determine the weather,” “using a harpoon on a string trying to get fish,” and “picking berries,” and often stereotypically with teepees in the background, a head band with a feather, and in outdoor settings. Interestingly, four drawings featured teepees even though teepees are not typical of traditional Aboriginal housing in most of British Columbia—only southeastern BC (Figure 9.4). It would appear that prior to instruction, the great majority of Grade 5/6 students did not view Indigenous Knowledge as science and did not think Indigenous people had contributed to the body of knowledge that we commonly refer to as “science.” The fact that eight of the 23 middle school students acknowledged Indigenous Science likely reflects the recent changes to the BC science program that includes at least some examples of Indigenous Science knowledge in the elementary program. Interviews with the Grade 5/6 teacher after instruction revealed that these students had been exposed briefly to examples of Indigenous Science knowledge as part of the new BC science curriculum. The fact that eight students who acknowledged Indigenous Science depicted traditional examples suggests that much work needs to be done to bring the inclusion of IK and IS into a modern context. The fact that 10 of the 22 high school students acknowledged Indigenous Knowledge as science is an indication that many students of Indigenous ancestry enter high school science classes with the anticipation that cultural science will be recognized. Many of these students came from communities with strong traditional cultural connections. This prior understanding of cultural science suggests that teachers need to acknowledge that Indigenous peoples have and continue to participate in science, and incorporate examples of Indigenous Science into the discussion. Students in both classes were visited by the researcher and invited to participate in the Indigenous Science workshop. I was introduced by the teacher as a non-Indigenous university professor in science and environmental education who had engaged in Indigenous education for 35 years. On the first day of the workshop, I engaged the students in a discussion about what they thought about science, the work of science, and who does science. I asked the students if they knew of any examples of Indigenous Science. One Indigenous student was a recent immigrant from India and shared his knowledge of the Neem tree as an ancient source of medicine. Several Aboriginal students shared their knowledge of medicinal plants, fishing and harvesting methods, and Aboriginal astronomy. After a 15-minute introductory discussion, I presented a powerpoint interactive talk illustrating and describing many additional examples of IS knowledge such as food cultivation, fish enhancement and transplanting practices, medicinal examples and the Nisga’a fish wheel. As well, wisdom practices that result in sustainable communities and environments were discussed—such as not taking more fish than you can eat and saying a prayer of thanks to the salmon for providing abundant food. On day two, I began the dentalium inquiry activity by showing a powerpoint presentation that described the intriguing story of dentalium shell money; how the dentalia shells were used as a true currency by Indigenous peoples across much of North America prior to contact with Europeans, and as a currency during the Pacific fur trade. I posed the question: “If the dentalia lay as deep as records indicate—100 to 150 feet below sea level, how did the traditional Ehattesaht and Quatsino people of Vancouver Island, BC locate and harvest the dentalia?” The students soon realized that this was a depth too deep and the water too dark for traditional divers to see and hold their breath, and the water too cold to sustain a diving operation. After much discussion, I challenged the students to work in groups and design on paper an implement and/or procedure for harvesting dentalia shells in sufficient quantities to sustain a far-reaching currency trade. The students were intrigued and had many ideas and questions. Day three of the workshop had the student groups reporting back to the class their method for collecting dentalium shells (Figure 9.5). A more complete description of the dentalia shell money story and the instructional strategy is described in Chapter 11. After instruction, I again asked the students to respond in writing to the same question: Is Indigenous Knowledge science? Or in different words, do Indigenous peoples have their own science? Table 9.1 below represents the students’ responses prior to and after instruction. Do Indigenous peoples have their own science? Figure 9.6 ▲ “The Aboriginal scientist is mixing herbs and chemicals to see what will happen.” Drawing by Grade 5/6 female student (2007). My grandmother and my mother taught me some years ago how to recognize herbs used for cooking and medicine. ‘Best advice: eat only what you have seen a bird or another animal eat before.’ I would like to be involved with Indigenous Science because it comes with knowledge and experience that modern scientists are only beginning to understand. The post-workshop data revealed an interesting mix of drawings and captions. Fewer students in both groups continued to draw stereotypical features of the “mad scientist.” All boys in both groups continued to draw what appeared to be male scientists (nothing indicated femininity), and the majority of girls in both groups appeared to draw female scientists. Significantly, a much greater proportion of drawings depicted examples of IS in modern settings—more often in the outdoors and in community situations, researching solutions to current environmental or health-related problems. As part of the post-workshop data collection, I asked the students where they got the idea that scientists “wear white lab coats,” “blow things up” and are connected to images like Frankenstein. The students recalled watching cartoons or movies that were about scientists in white lab coats, working in science labs, with hair and glasses like Einstein, inventing bombs or Frankenstein-like images. Science was frequently viewed as “too much work,” “too boring,” “too complex to understand,” “I’m not intelligent enough,” and “I wouldn’t enjoy it.” One student wrote, “scientists do horrifying things like create climate change,” and one wrote, “scientists are very anti-religious.” Two students wrote positive comments: “It’s a lot of fun” and “You might be the first to discover something.” This finding is consistent with the work of Jarvis (2000), who concluded that many children do not want to be scientists because “scientists never have fun.” Although increasing students’ interest in science careers was not an intended outcome of a 3-day workshop, the lack of interest in science careers from both middle school and high school students was disappointing, although not surprising. In analyzing students’ drawings, we have to ask ourselves whether they drew scientists as eccentric nerds working alone in a lab because that is what they think scientists are really like, or because that is what they think we expect them to draw. We must also ask whether students refrained from drawing Aboriginal people involved in science activities prior to the workshop because they thought we expected them to draw Caucasian scientists. Many students have learned to “play the game” of school science and this caveat must be acknowledged. Nonetheless, it appears that the Indigenous Science workshop influenced the students’ perceptions regarding scientists, the work of scientists, and who does science. The workshop provided students the opportunity to explore science from a multi-science perspective, engage in an Indigenous Science/technology problem-solving activity (the dentalium activity), and identify science knowledge required by the successful Indigenous practitioner. Their beliefs about science and science stereotypes were challenged. The workshop showed students how Indigenous peoples have always practiced forms of science and are involved in the world around them. Students enjoyed doing science from an IS perspective, and there were some serious, thoughtful changes in their ways of thinking. Clearly, scientists have an image problem. The scientist all too frequently has an extremely intelligent, nerdy, and condescending personality. The question arises, where does this image problem come from? Research has shown that there are a number of influences on an individual’s perceptions of what a scientist is, including school curriculum, children’s literature, television, movies, cartoons, comic books, and the print media (Eugster, 2013). A bad image hurts scientists on many levels. Students with a poor image of scientists may be dissuaded from pursuing science as a career, and they might not see the relevance of science to their everyday lives. Long and Steinke (1996) analyzed four children’s science television shows: Breakman’s World, Bill Nye the Science Guy, Mr. Wizard’s World, and Newton’s Apple. They found that these shows presented mostly a positive view of scientists by showing a wide variety of people (including women and minorities) taking part in science, and that it can be fun. They also avoided evil or dangerous images of scientists that are often found in children’s literature. They noted however, that white males were still the predominant main characters and some characters had eccentric and antisocial characteristics. One recent television study of Grade 7 female students showed a surprising shift, with 50% of the participants drawing a female when asked to draw a scientist (The Scientist on Camera, 2006). This is in sharp contrast to Barman’s 1996 work on children’s images of scientists. The authors suggest that TV programs such as CSI, which show male and female scientists as equals and science careers in positive light may be responsible, at least in part. After reviewing the literature (Eugster, 2013) concluded that despite efforts to modernize the curriculum, elementary school children still see scientists as white, male and eccentric, and children’s literature generally reinforces this stereotype. Interestingly, researchers gave television the greatest credit for portraying scientists accurately and positively. As Eugster (2013) suggests, “the majority of scientists are intelligent, passionate, dedicated, amusing people, and if the portrayal of scientists continues to become more and more accurate, then the general public’s perception of who scientists are and what they do will only become better” (p. 3). Much research has illustrated that most students become “turned off” to science around the middle grade years and thus, fewer and fewer individuals later enter science and science-related careers. The perceptions students hold of scientists and the work they do are often cited as significant contributing factors to this situation (Finson et al., 2006, p. 13). Thus, students’ perceptions of scientists are developed early, and although they may change with significant life experiences, they are often resistant to change. We might rightly conclude from such studies that in order to capture children’s interest in the sciences, it would be important to capture their imagination prior to the age of 11 or 12, before they have made up their minds not to cultivate an interest in science. We should not be surprised that students of Indigenous ancestry find it difficult to envision themselves as future scientists. They are told, directly or indirectly, from an early age that Indigenous people have never had science, that Indigenous people don’t “do” science, and that scientists are an elite group of privileged nerds wearing white coats who spend their days alone, inside in a laboratory, conducting boring research and blowing things up: the message is inculcated––science has nothing to do with their lives. Teachers play a central role in sharing and creating perceptions and stereotypes about science and scientists. Teachers need to be made aware of the stereotypical images they hold and may convey to their students. Examining students’ drawings of scientists is one way of enabling teachers to become aware of their students’ stereotypes in a time-efficient manner while reflecting upon avenues of possible instructional change. In addition, teachers must abandon their own stereotypical views of science and scientists if we hope to encourage girls, Indigenous students, and other minorities toward careers in the sciences. Using Indigenous role models, teachers should provide information and help to design experiences to build more realistic, multi-cultural images of scientists and their work. Some instructional enhancements include providing knowledgeable guest speakers (Elders, Indigenous scientists, female scientists, and scientists from a range of backgrounds—Chinese, Japanese, East Indian, Christian, Hindu, Muslim, etc.) who are able to communicate with teachers and students. Exploring how science (including WS) is practiced in different societies provides students with a more diverse orientation to science. Another less direct level of intervention includes research projects involving scientists, the study of science-related Indigenous biographies, and more investigation involving the science of different cultures. Additional strategies include role-playing, discussions, reading and writing about scientists at work. Also, direct discussions about stereotypes in the media are also valuable. An additional consideration for teacher educators is career awareness. There are many jobs in which science and engineering are important, including: car mechanic, dental hygienist, veterinary, electrician, landscape gardener, master chef, wildlife conservationist, nurse, fire chief or weather forecaster. Helping children of Indigenous ancestry understand that Elders want their children to pursue science-related careers, and that Indigenous communities are critically short of Indigenous science teachers, as well as biologists, engineers, geologists, nurses, etc., may help create positive images of scientists. Internet connections with scientists (both Indigenous and Western scientists) and working on collaborative projects with scientists are other ways students can engage in doing science. Such activities help students understand that Indigenous and Western Science are distinct yet equally valid paths that can be walked upon in order to generate understanding. Also, students need to understand that scientists are ordinary people—intelligent, humorous, with a range of hobbies, often with deep family ties, and engaged in serious and important work in the lab, on the land and in the community. Before reading this article, ask the students to draw a picture of a scientist at work. Write a caption explaining what the scientist is doing. Share their drawings with a partner. Analyze the drawing in relation to symbols, gender, ancestry, indications of danger, working indoors, etc. Explore ways teachers may influence perceptions of scientists as ordinary people rather than nerds. Draw a picture of a scientist at work. Then invite a scientist into the classroom (a female scientist, an Indigenous scientist, etc.). Draw a picture of a scientist after the visit to the classroom. Discuss. Barman, C. (1997). Students’ views of scientists and science: Results from a national study. Science and Children, 35(1), 18-24. Bodzin, A. & Gehringer, M. (2001). Breaking science stereotypes: Can meeting actual scientists change students’ perceptions of scientists? Science and Children, 38(4), 36-41. Long, M., & Steinke, J. (1996). The thrill of everyday science: Images of science and scientists on children’s educational science programmes in the United States. Public Understanding of Science, 5(2), 101-119. McDuffie, T. E., Jr. (2001). Scientists—Geeks & nerds? Dispelling teachers’ stereotypes of scientists. Science and Children, 38(8), 16-19. Moseley, C., & Norris, D. (1999). Pre-service teachers’ views of scientists. Science and Children, 37(6), 50-53. The Scientist on Camera (2006, November 11). Slate Magazine. Slate.com. Yore, L. D. (2008). Science literacy for all students: Language, culture, and knowledge about nature and naturally occurring events. L1-Educational Studies in Language and Literature, 8(1), 5-21. Chapter 9 - Changing Students’ Perceptions of Scientists, the Work of Scientists, and Who Does Science by Gloria Snively and Wanosts'a7 Lorna Williams is licensed under a Creative Commons Attribution-NonCommercial-ShareAlike 4.0 International License, except where otherwise noted.